Need to monitor many computers at the same time? Are you worried about a pegged CPU, memory paging, lots of swap space activity or low disk space? What about high network traffic? These things are readily available on Amazon through AWS CloudWatch. I decided to implement 1 of 2 major monitoring stacks. The first stack is: Logstash, Elasticsearch and Kibana (ELK stack). The second group of technologies is: Collectd/Statsd, Carbon/Whisper and Graphite/Graphana. I implemented the later. ELK stack: Is great for text heavy documents. Elastic Search is based on Lucene, a popular open-source search engine. Graphana/Carbon: is great for time series analysis with an emphasis on near realtime data feeds. Collectd provides a convenient plugin/interface to operating system statistics. Collectd – data collection software with a plugin architecture. Common plugins seen above include: CPU, Memory, Disk Usage, Processes, Network Traffic, Apache metrics and much more. Statsd – Used more for application monitoring. You can send custom metrics based on set intervals. The common 4 metrics I saw: gauges, counts, sets and intervals. The first one takes the last of measurement within an interval and reports it. Counts aggregate data over 10 seconds. Sets return a unique count of values encountered (via UDP). Intervals are time-based calculations (like rates). Carbon/Whisper – A data store focused on time series aggregation. Data is aggregated based on two configuration files. The first sets up regex matches (used to categorize TCP traffic) followed by a data retention policies as well as specifying polling time-frames (typically in seconds or minutes). The second file specifies the type of aggregations available: sum, min, and max. Graphite/Graphana – Graphite is a front-end dashboard tool for carbon. Graphana serves a similar role, but with a sleek black UI (featured above). Both are similar to Kibana. They both provided dashboard and graphing utilities to their respective data stores. With Graphana being able to access other sources (like ElasticSearch). 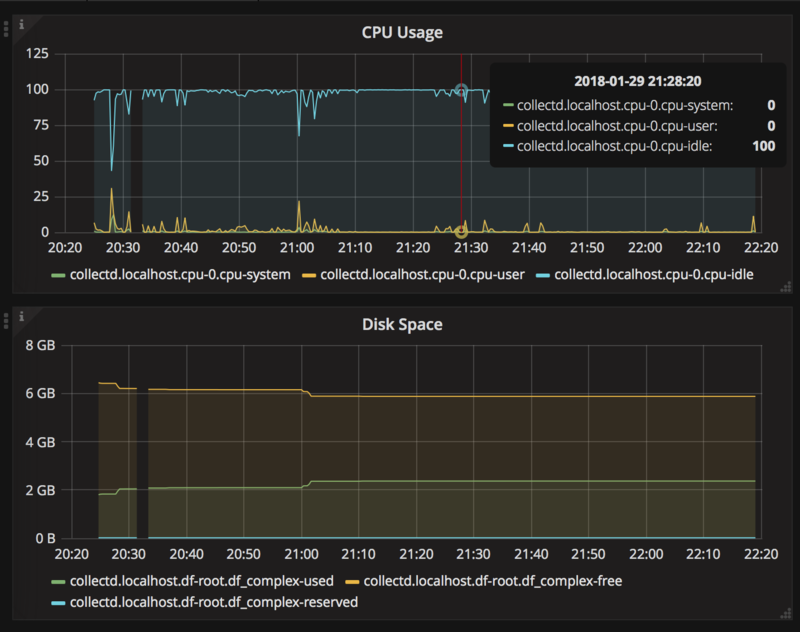 For my Graphana localhost dashboard, I used CPU, Memory, DF and Processes modules from Collectd. This entry was posted in Carbon, collectd, Data, Data Modeling, graphana, graphite, Monitoring, Software Systems, statsd on January 30, 2018 by Chris Kottmyer.